The following are the comments I prepared for the roundtable “The Arts and Humanities Respond to the Anthropocene.” They follow in the line of critical thinking on the Anthropocene initiated by gatherings like the Anthropocene Project (see here, here, and here, and some of the posts at A(S)CENE) and journals like Environmental Humanities. As a cultural theorist, I come to the topic naturally asking what the different theoretical paradigms in cultural and environmental theory can say about this term “Anthropocene.” These paradigms stretch across a spectrum that can be very loosely grouped into “realist” approaches and “constructivist” approaches. The second (constructivism) considers the term as a way of naming something into existence, such that having been named it becomes a fact of which we can speak, a discursive reality. It then raises questions about how and why it is brought into existence, by whom and through what means, bringing what opportunities and presenting what risks, to whose benefit and at whose expense, and as opposed to what alternatives. 1. It provokes thought, generates attention, brings other terms/groups/discourses together in ways that facilitate communication, exchange, and growth (funding, etc.). Specifically, it brings the Human and the Natural together into a single temporal and spatial unit: the planet as defined by human activity (and interactivity with it). It is, in this sense, like “globalization” but larger, with ecology now woven into this global frame. For environmental humanists (among others) it lends the credibility of science (geology!). For earth scientists, it expands their purview to include the human. These are all clear gains and make the term worth supporting and working with. Any effort to bridge the “two cultures” divide in a way that recognizes both human agency and material reality is a good thing. 2. At the same time, it continues a certain trend of rendering humanity singular in a way that blurs differences between differently situated human groups — differentiated according to race, class, gender, social group, worldview, technical means, ecological livelihood, centrality or peripherality within political and economic systems, and so on. This means it blurs differences between different socio-ecological orders, that is, the very things that neo-materialist and post-constructivist approaches in the humanities and social sciences — like actor-network theory and others — are specifically attempting to focus on. In this sense, it does not particularly help us think through the ways we live on this earth, interacting with its other inhabitants, components, and flows. It is in this sense empirically inaccurate, or at least reductionist. Humanity has (arguably) never acted — willfully, consciously — as a single unit, even if it can be described analytically as a single unit. Humans have been around for a long time and lived in many different ways, so “Anthropocene” is not really reducible to humans or humanity per se. Instead, it involves tools (and far from all tools) and ways of engaging those tools in relations with landscapes, ecosystems, and so on. It’s these that we need to get a better handle on. To what extent “Anthropocene” helps with this is debatable. In his keynote address last night, Andy Revkin challenged the audience to come up with a better term. Let’s think about some of the alternatives that have been proposed for capturing the current planetary era in ways that allow us to critically assess it and envision alternatives to it. Here we are acknowledging that the point of “the Anthropocene” is to name an epoch in a pragmatically useful way, a way that allows us to understand its historical-geological novelty, but also to understand our positioning within it and the possibilities we have for shifting it in different directions. Anthropozoic, homogenocene, et al. : proposed to do the same work as “Anthropocene.” I like “homegenocene” because it suggests that it’s not simply the Anthropos — all humanity — that is central to the current era, but that it’s the process of global biological homogenization that was launched in particular through European colonization of the world. Neither of these have particularly caught on. Capitalism (with its many variations, such as late capitalism, et al.) or “capitalocene“: proposed by Marxists and socialists, these have the virtue of identifying the particular political-economic system that is agentially more central (if not exclusive) to the processes denoted by the Anthropocene. Patriarchy: proposed by feminists, identify an important trajectory of social and gender relations, but undervalue other links (such as social hierarchy, emphasized by anarchists, capitalism, et al.). Anthropocentrism: proposed by environmental thinkers who focus on ideas and worldviews; same problems as ‘Anthropocene’ but arguably without the benefits. Too idealist (sociologically), not materialist enough. Modernity/coloniality: proposed by postcolonial and indigenist theorists; clearly recognizes the global socio-historical processes that have dramatically rearranged human societies over the last 5 centuries, but arguably undervalue the ecological and certain other links. Unsustainability / sustainability: This still captures something about the ongoing relationship between humans and the nonhuman in a way that the other terms do not; but its many uses, and criticisms of some of these, are well known. Which, if any, of these terms best encompasses the condition we (planetary humanity) are in and the challenges we face? Terms like “homogenocene” and “carbon capitalocene” arguably capture more of the important links — economic, technological, political, ecological — that need to be captured in a nomenclature for the present condition than “Anthropocene.” None of them captures the ethical-philosophical particularly well. But perhaps there is virtue in simplicity, and the latter term may be provocative enough for certain purposes. Then there are terms that point to what can be done, or to a vision of a future beyond the Anthropocene, or a “good Anthropocene,” as Andy Revkin called it last night. Thomas Berry’s “Ecozoic” is intended to do just that. (Earlier terms like “New Age” meant to do the same, but were too vague to be useful.) “Ecotopia” is perhaps a friendlier term. These indicate the direction I’d like to see developed more by eco-humanists and artists. Some artists are going there, and are doing so in ways that capture the complexities of the Anthropo/carbon capitalocene and its Ecozoic alternatives (see, for instance, those profiled in Linda Weintraub’s To Life: Eco-Art in Pursuit of a Sustainable Planet, or the international work of Betsy Damon, who presented this morning). Where to with the Anthropocene and its alternatives? is anyone actually doing any research into how people use/react-to these terms? Good question. Environmental communication scholars have done some research on the use of terms like “global warming” versus “climate change,” “tree hugger,” et al. I know there’s been similar research by political communication scholars on terms like “liberal” and “conservative,” and probably on “democracy” and others. I’ve seen informal (interpretive, not very systematic) analyses of the many uses of “sustainability.” But I’m not aware of any research on public responses to terms like “Anthropocene” or some of the others. Analyzing academic uses of terms is much easier–you just do some citation analysis. For my own somewhat obsessive purposes, I’ve been using Cyborgocene, taking a more mytho-poetic approach, altho I’ve been thinking about a bit more rigor, and updating my terminology somewhat. I think it captures somewhat the (secondary) agency of the pervasively coded environment we are moving toward, and the indispensability of code/human hybrid for planetary effects of what we frequently term human activity. Thanks for that link, Atomic (Bob?). I look forward to more on your approach. In considering why the name “anthropocene” has been proposed, why it has been embraced by many, and what might make a better alternative, it is instructive to look at how geologists have named previous epochs. From such a view, “anthropocene” immediately stands out as an anomaly. There are ten named epochs covering the last 145 million years. None named for the cause of changes to the planet. Instead, all the names refer to the changed composition of species present in each epoch. For example, consider the epoch change caused by the meteor which drove the dinosaurs and vast number of other species extinct 65 million years ago. The resulting new epoch is not called the Meteorocene or Chicxulubocene. It does not refer to a causal agent at all. It is called the “Paleocene” which translates to “ancient recent” or “ancient new”. The reference is to the most ancient period in which the planet’s species composition was similar its modern composition. The current epoch, driven by the last global glaciation event and the relative stability since, is not called the “Glaceocene” or “Neoglaceocene”, it is the”Holocene” which translates as “wholey/entirely new/recent”. The reference is to the global species composition of the past 11,500 years in its difference from the Pliestocene epoch which preceded it. So while many, including Revkin, assume that a new Epoch must necessarily be named for its causal agent, doing so would actually be anomalous and contrary to long-standing geological naming protocol. This begs several questions: Why break from the naming protocol in the one and only instance where humans are thought to be the causal agent? Why do we take take this gesture so thoroughly for granted that we barely notice the change in protocol? What belief system(s) drive the shift from epoch names reflecting the global composition of millions of species, to a name based on the power of one species, who happens to be us? If we were stick with the geologic tradition, we’d ask whether their has been a significant shift in species composition between the Holocene and the “present.” The answer is yes. On the one hand, the geologic record of the future will reflect the mass disappearance of species from the global fossil record due to extinction. On the other hand, the future fossil record will demonstrate the sudden arrival and proliferation of a small number of species (sheep, pigs, cows, dogs, wheat, rice, cowbirds, starlings, etc.) around the world. Taken together, these two recent events will cause the fossil record to reveal a radical homogenization of the planet’s species between the Holocene (or perhaps the Pliestocene) and the current time. A name along the lines of the “Homogenocene” is fitting for such a period. In keeping with the geological naming tradition, it defines and names the epoch in terms of substantial changes in the global composition/distribution of plant and animals species. In distinction to “homogenocene” (or a similar term), “anthropocene” is reflective of the dominant Western paradigm of anthropocentrism. The same self-centered, providential belief in human exceptionalism that drove “us” to homogenize the planet’s species is now driving “us” to dismiss the planet’s species as the base geologic naming premise in favor of naming the planet after ourselves and our mighty power. Thus “anthropocene” is not an anecdote to or struggle with anthropocentrism, it is its culmination. From another angle, consider the assertion that the name “anthropocene” breaks down the division of humans and nature by recognizing humans are a geological force. There is a unity in this to be sure, but only at the cost of eradicating one of the binary terms: nature. Does it really make sense in any philosophical, political, emotive context to say we have accomplished the conceptual unification of humans and nature by denying the existence of nature, by proclaiming that we humans are now the sole, or at least most dominant “natural” force? How is it that we only got around to feeling at one with nature at the moment when we decided we were the most powerful force in nature? If the human/nature divide is fundamentally untenable at all times, why did we not embrace our naturalness at an earlier moment when we believed ourselves a species among species rather than the uber-species? It seems to me that “anthropocene” does not signal a unity of humans and nature or a breaking down of conceptual barriers. It is the proclamation of dominance. In thinking through the name “anthropocene” we must also note that in parallel to the formal geologic epochs, there have always been informal names. And the informal name for the recent has always been The Age of Man. From the very moment it became possible to imagine an Age of Man, i.e. from the moment we discovered that the Earth was old and humans young, geologists have informally named the “current” period the age of man. Indeed, The Age of Man is coextensive with the science of geology. If, as the story is often told, geology has always been at war to liberate itself from religion, we must sincerely ask if it in fact won. Or if anthropocentrism is not the common kernel of both, so deeply believed in as to be nearly invisible to both, perhaps especially to geology. Buffon was the first the posit a semi-modern, semi-scientific earth history in the late 1700s. His seventh and last historical stage is defined by humans governing nature. At no point from them to the present have geologists not informally named the current time something translatable as Age of Man. The last incarnation before anthropocene was anthropogene (with a “g”) The term has been around since the early 20th century, but caught fire in the 1950s and 60s. To this day it is used in geology publications in eastern Europe. So is anthropozoic, the prior popular turn. Geology journals were even named after it as they are now named after anthropocene. In this light, “anthropocene” is more fundamentally the continuation of a long trend– a trend coextensive with modernity, colonialism, and geology as modern science– not a divergence or awakening. Kieran: Thanks for your lengthy and thoughtful reply. I was wondering if you’d be willing to have it re-posted as a new guest post on the blog (cross-posted with A(S)CENE), perhaps in combination with the thoughts you posted on Tim Morton’s blog last year. It’s provocative and deserves to be considered in its own right. Or have these thoughts been published somewhere in a way that I could link to them? Please let me know. Thanks Adrian. Please do re-post my comment as you suggest. The comment is a precursor to a manuscript I’m writing– tentatively titled “No Anthropocene, Not Now”– which catalogs about twenty different geological terms translatable as Age of Man going back to the very first quasi-scientific geology texts in 1770s. They form a continuous, unbroken history such that at no time since it was logically possible to conceive of an “age of man” have we not done so. The analysis could be generalized and pushed back via the ideas of providence and the great chain of being to span the Middle Ages, but that would no longer be temporal or geologic as you can’t really speak of the Earth having a “history” and thus dividable into “periods” until the late 18th century. Interestingly, the public popularity index of the dominant terms forms a sine wave which I interpret thusly: naming/understanding the “now” as the Age of Man fulfills a deep psychological need in Western culture, but it is also irrational, thus at odds with another deep Western value. Just as we see today with “anthropocene” a new term appears, slowly builds in popularity for a decade or so, explodes exponentially for a decade or two, then declines in popularity over several decades in the face of critiques finding it anthropocentric, unscientific and ill defined. When the term’s popularity declines below a threshold making it incapable of fulfilling the public psychological need, a new term appears and the cycle begins again. Though we, in the necessary blindness of the historian of the now, are impressed by the rapid adoption of “anthropocene”, it is actually less culturally pervasive than any of the previous dominant terms when considered in terms of relative cultural popularity. This is because “anthropocene” is still relatively early in its sine wave development. Also interesting is that the peak relative popularity of each dominant term has steadily declined over time. I interpret this as a combination of 1) culture becoming a bit less anthropocentric since the 18th century (conceptually at least), and 2) the competing value of rationality increased in public weight over the same period. The reference to Derrida in the provision title, who himself was referencing Francis Ford Coppola, concerns another critical psycho/ontological function of “anthropocene”: it is, and always has been, revelatory in the same sense that the apocalypse is revelatory. All will be revealed in the end, not least because the end of the story is what makes the story a story. A story without end is not a story. The end guarantees meaning, summation, the kind of clarity one can never have while inside the story which is not yet a story because it has not ended. Thus Lyotard asks: “How does one know whether the end is an end, if one is not narrating it?” So in addition to simultaneously naming/constructing the existent (as you note above), “anthropocene” also secures the meaning of existence, meaning as can only be revealed (or hoped to be found) in the last epoch. And it has to be said, “man” never named a previous epoch the Age of Man. The age of man has always been the now, the last, and the clarifying moment when we finally understand. Unless. That’s what the stone said, right? Those who are less sure of what it all means, what needs to be done, where we are going, that “nature” is over, that a post-partisan, post-political, post-gender, post-race, post-class, universal “anthropos” made all this and will henceforth, as one, be in charge of all this…those who can not tether either the tenability of or escape from nature/culture…those who suspect that existence–which necessarily appears as a story–is not a story because it has neither end nor outside…those who can’t not worry about the alignment of revelation, power, and confirmation…those who feel the sine wave…They will tend toward the many rather than the one, immersion rather than exception. 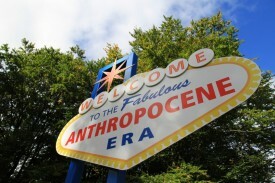 They will have trouble naming the name of anthropocene. OK, I’ll re-post with a few edits (if you don’t mind), probably later this week. I look forward to your manuscript, which sounds really interesting. This is great, Adrian. What I would add is that “Capitalocene” is not named after capitalism narrowly conceived (as political economy), but rather capitalism as world-ecology; capitalism as, at once, producing changes in the web of life, and also _produced by_ nature as a whole. Thus, the intervention of the capitalocene — an ungainly term, to be sure — is directed towards the dualist approaches of both left greens and mainstream approaches: “eco-Marxism” as well as the Anthropocene perspective of the earth-system scientists. The capitalocene, then, marks an era shaped broadly by the endless accumulation of capital, in which “capital” is a relation (a web of relations) co-produced by humans and the rest of nature. Thanks for that clarification, Jason. I’ve appreciated your writings on capitalism as world-ecology and strongly recommend them to others. Readers may wish to start with some on this list.